What our users are saying about SmarTend? What is SmarTrend®? Why should I “Trade The Trend®?" Trading the Trend takes the emotions out of deciding on your investments. Are you prepared for a volatile trading environment? Take a look around at the US and global markets. What do you see? How can you know when to buy and sell? Unknown factors and world events will continue to have major impact on the rising and falling prices of stocks. Are you ready? Clearly, the old “buy and hold” model isn’t working in the current market environment, so active trading strategies have become increasingly important in order to both maximize returns and minimize losses. 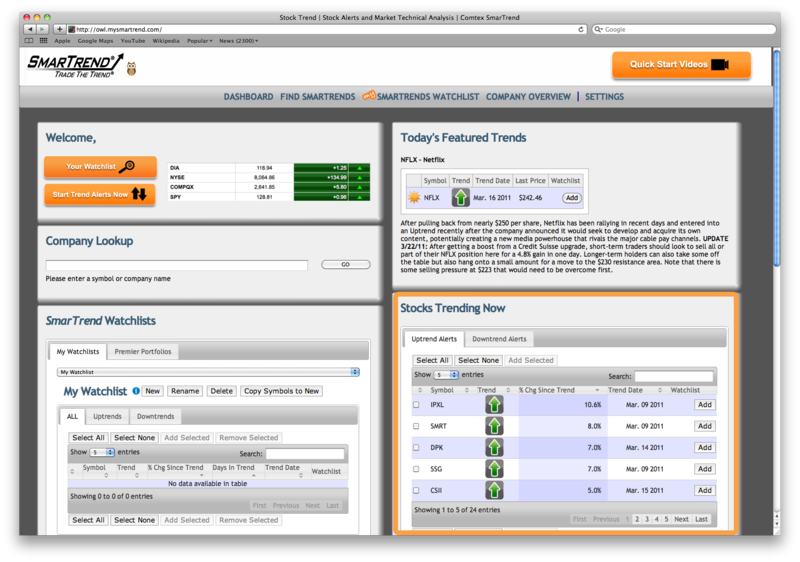 Trading the Trend, using the SmarTrend trading system is the solution. SmarTrend eliminates the guesswork and emotions associated with investing, and most importantly, produces exceptional returns. Once you’ve reviewed the short video tutorials – or spoken with one of our analysts by phone – you’ll approach trading with the precision of an engineer. More good news? Complete beginners – and experienced traders – can both learn how to Trade the Trend. SmarTrend uses “price-pattern recognition technology” to analyze more than 5,000 securities traded on the major U.S. exchanges and OTC/NASDAQ in real-time, scanning all securities every 5 minutes to determine changes in momentum. 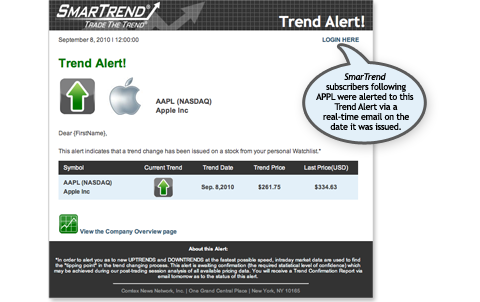 SmarTrend Alert® doesn't predict; it identifies Trends. Trends exist everywhere, and stocks are no different: they trend up and they trend down. To maximize profits – while rigorously managing risk – SmarTrend doesn’t alert you “before” a trend begins or ends: It only alerts you when a trend has a proven change in direction. However, there’s no need to figure out 'why' a stock has changed its trend direction – just pay attention to it. Risk management is a top priority. SmarTrend eliminates exposure to emotional hysteria and buy/sell frenzied behavior. Trading the Trend is the best protection for when bubbles pop and everyone starts running for cover. As a SmarTrend subscriber, you create portfolios in your personal Watchlists and receive instant email alerts when one of the securities you are watching changes its trend - information you will want to know to protect your investments or better time new stock purchases. SmarTrend keeps investing simple. 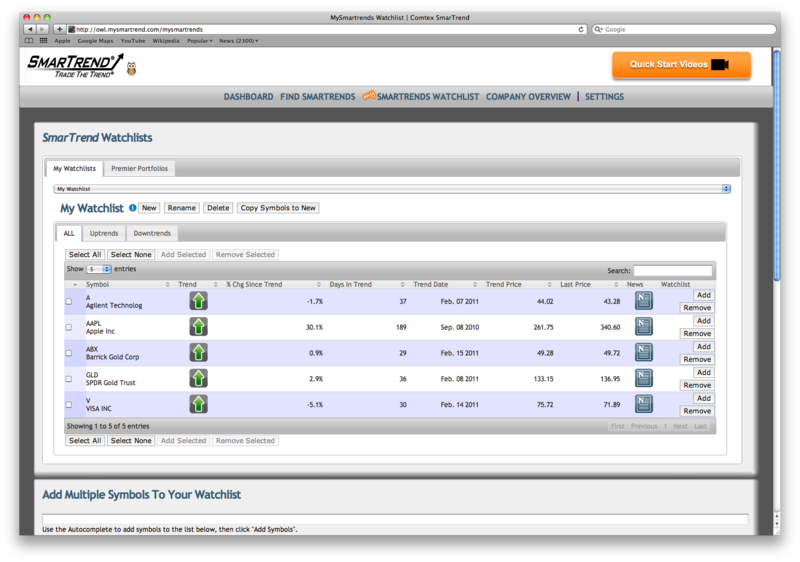 Try SmarTrend for free. Get 14 days of full system use to see SmarTrend's results. Put SmarTrend to work for you. What will you get? SmarTrend Morning Call, our daily email market report – with technical analysis, SmarTrend proprietary indicators, and a clear picture of what to expect from the market. Unlike regular investing, you have nothing to lose - and everything to gain - by trying SmarTrend free for 14 days.